Another installment in the popular economic strategy game series published by Ubisoft and developed since 2011 by Blue Byte Software - Ubisoft's subsidiary studio known for working on The Settlers series. Anno 1800 is another installment in the popular economy strategy series developed by Blue Byte Software – Ubisoft's subsidiary studio. The game is available on PC and, as the title might suggest, is set in the period of industrial revolution – a time of grand geographical and scientific discoveries, as well as the ever-present industrialization. 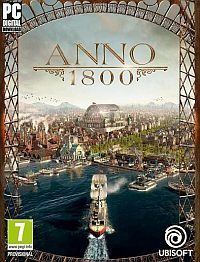 Like the previous installments in the Anno series set across different centuries, in Anno 1800, a player assumes the role of a steward tasked with establishing a prosperous metropolis. One begins with a minor settlement inhabited by a handful of subjects, who have to gather resources, erect new buildings, and create complex trade relations allowing for the fast development of the city infrastructure. All the excess resources can be traded for the goods one currently needs the most. A player should remember to tend to the needs of the settlers and properly balance the budget, which at times of crisis can be patched up with trading the goods and increasing taxes – this, however, results in the decrease of population's happiness level. Diplomacy is also an important aspect of the game, as it allows a player to establish various relations, enter alliances, and wage wars with the neighboring states. The PC release of Anno 1800 offers the single player story campaign, a free play mode, and an elaborate multiplayer mode. Anno 1800 features high-quality visuals. The developers have designed detailed elements of both infrastructure and environment – each production process can be observed by players from up close in order to check, e.g. the progress of production in the local steelworks. The game's premiere coincided with the series' anniversary – the franchise has been started in 1998 with Anno 1602 and since then, the series has been expanded with a number of full-fledged installments and spin-offs developed for various platforms. Game score 7.96 / 10 calculated out of 115 players' votes. Expectations before the premiere: 8.8 / 10 calculated out of 484 players' votes.